Today the weather was cool and overcast, and even though it looked like rain, I went to Long Hill Gardens with my daughter to walk the dog. It was a great idea because lots of plants are flowering (rhododendron, azaleas, even some iris). I took plenty of pictures with my phonecam. 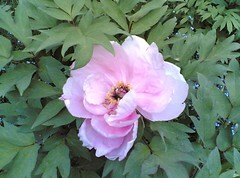 But this is my favorite, a single pink peony in the soft light of the overcast day. If you look closely, you can see the tiny blossoms of blue forget-me-nots poking through the leaves. Last week, I bought some lemons for cooking, and thought they would look nice in my new square glass vase (the container for my Mother's Day bouquet). 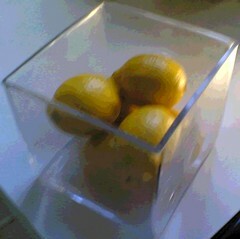 I liked the shapes of the lemons in the square vase, and decided to take some pictures with my phonecam before I started dinner. I was rushing and it was hard to get the results I wanted. Of the pictures I took, this one came closest to the composition I was after, but it was slightly out of focus. I decided to open the image in Painter IX so I could posterize it. I adjusted the levels till I got the effect I wanted. The saying goes that if life gives you lemons, you should make lemonade. Sometimes you can also make art. This morning I went to Red Brick to work on this painting for an hour. I am hoping to finish it up this week because this weekend is open studios. The flowers are now completely bedraggled, but are still useful as place-holders. Today I decided to work on the brick in the background, but in preparing to do that, I realized that the position of the table needed to be lower on the picture plane. I painted over the section that used to be table and is now brick. I think that improved both the composition and the perspective. Then I spent some time figuring out where to put the lines for the brick. (I used my reference photo, but also spent time measuring the actual brick to get the proportions right.) Then I put the lines in with a brush, using my T-square as a guide. I decided that I like the pattern of the brick in the painting, so I will keep going. To be continued. . . .
During an afternoon walk at the pond, I noticed these daylilies beginning to open, so I took some pictures with my phonecam. 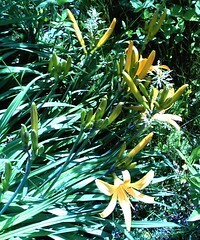 I love to see daylilies planted in gardens, in rows against stone walls or fences. But it even better to see them growing by the side of the water. Tonight I adjusted the contrast a bit to make the detail easier to see, and then cropped the image to focus on the bright colors and the patterns of the leaves and stems. 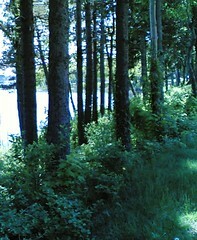 This image began with a photo that I took today with my phonecam from the boardwalk at Newburyport. It was surprisingly cool and breezy in Newburyport, so I was taking pictures quickly. The boardwalk is great for dog-walking and people-watching, and you get a beautiful view of the water. Tonight I cropped this image from the original photo to focus on the two sailboats, then I opened the image in Painter IX and posterized just a bit. 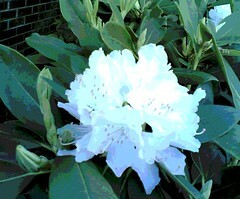 Rhododendron are starting to blossom, and they are blooming everywhere, all over town. Yesterday, I saw this white rhododendron, and I liked the way it looked in the late afternoon sun, so I took some pictures with my phonecam. This is the shot I liked best. Tonight I opened the image in Painter IX and posterized it. With the warm weather we are having this week, it is nice to take walks by the pond. 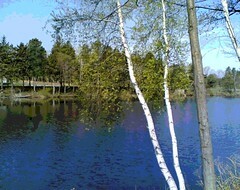 This image is cropped from a recent photo that I took with my phonecam. The air seems cool near the pond, and it probably is a few degrees cooler because of the water. But I think it also feels cooler there because the deep shadows, the dappled light, and the bright water look cool to the eye, even when the weather is very hot. This image began as a photo that I took the other day at Long Hill Gardens with my phonecam. I love these little heart-shaped flowers so I stopped to take a picture! Tonight I cropped the image and then posterized it in Painter IX to focus on these amazing little blossoms. I have seen similar heart-shaped flowers in fuchia and yellow, especially in Northern Ireland. 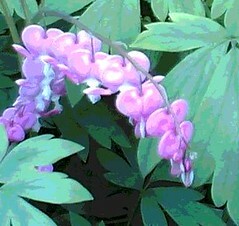 Those are also beautiful, more dramatic, but I think I prefer the pink ones, which are also called "spring-flowering bleeding heart." This flower is also known as the "living valentine" which is the name I prefer! I went to Red Brick this morning to work on this painting for an hour or so. In the studio, the remains of the flowers are still in the vase, but there are no blossoms left, just stems and rather tired leaves. But what is left is still helpful because I can see where light should be hitting the leaves. I have been trying to add light to the blossoms and leaves to add volume to the painting and to suggest where the light is coming from (which is complicated because the vase is between two windows). Today, I concentrated on the leaves, adding light, shadow, and definition. I had to look hard to sort out what each leaf and stem was doing. To be continued. . . . This image was cropped from the background of a photo I took today with my phonecam during a walk around the pond at the Cummings Center here in Beverly. I was trying (unsuccessfully) to catch a picture of a family of ducks swimming across the pond. I didn't notice the reflection of the trees at the time, but I did see it later, when I loaded my photos into the computer. So tonight I cropped this image out of the photo to get the composition that interested me. After cropping, the image was in fairly soft focus. Then I opened it in Painter IX, corrected the color, and then posterized it. 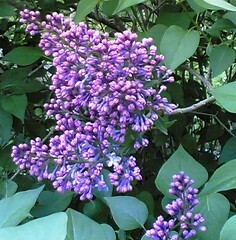 This morning, I took a walk around the neighborhood and came across some really beautiful lilac bushes, one with pale lilac blossoms, and the other with deep purple flowers. 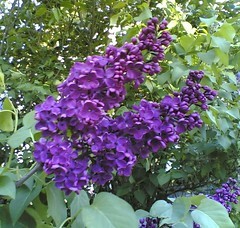 I took lots of pictures of both kinds of lilacs. 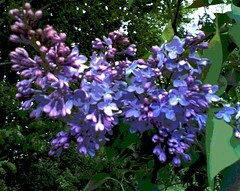 I was hoping to post the picture of the deep purple lilacs because they are so unusual. But when I was getting ready to post the photo, I noticed that some of the lilac leaves had been nibbled on by bugs with no aesthetic sensibility. I tried to crop out the problem, but that not only ruined the composition, but also threw the flowers out of focus. So I opened the image in Painter IX and used a little digital pastel to repair the leaves, and here it is. Last Sunday, on the way to the Mother's Day Tea at Castle Hill, I tried to take some pictures of countryside as we drove toward the Great House, but didn't have much opportunity. But tonight I was looking at some photos that I took a few summers ago, when my daughter and I walked around the Castle Hill Estate. It was August and the sky was overcast. I found this image among the photos I took that day. I liked the composition, but there were some scraggly old bare branches hanging down in the middle of the photo. I tried cropping the image, but it changed the composition too much. So I opened the picture in Painter IX and did a little digital tree-trimming with digital pastel. 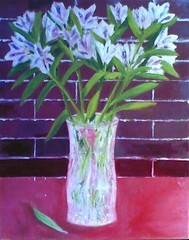 I went to Red Brick early this morning to paint for an hour. I am still working on the shape of the vase, so for part of the hour, I had the painting upside down. I also looked at it in a mirror as I made changes to check my work. Although the vase needs more attention, I am happier with it already. I also changed the position of the fallen leaf on the table. I started adding a bit more light and shadow to the blossoms and leaves, and began to add shadows to the table surface, but the day was too cloudy to do very much. Anyway, it was time to stop for the day. To be continued. . . . 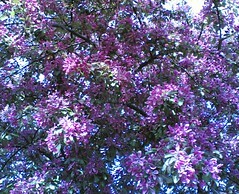 This image began as a photo taken with my phonecam during an excursion to see lilacs at Long Hill Gardens. When I cropped the image to get the composition I wanted, the focus became very soft. Tonight I decided to posterize it with Painter IX, and I liked the result, so here it is. My daughter and I have trying to make it to Arnold Arboretum in Boston to see all the lilacs in bloom, but bad weather and tight schedules have been getting in the way. So today we took a short trip to see the lilacs at Long Hill Gardens right here in Beverly, and we were not disappointed. I can never decide if I prefer the buds or the blossoms, so I took pictures of both. Here's one of the photos I took today, cropped to focus on the pattern of the buds getting ready to open. Our friend Ciarán from Belfast was visiting for a few days. It was great to have him here! 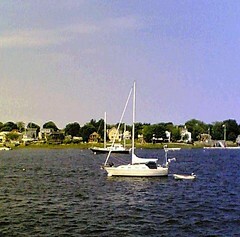 On his last evening in the Boston area, we drove to Marblehead for dinner. 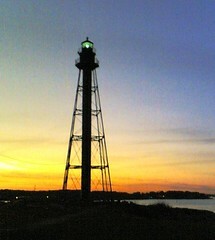 Afterwards, we went to Marblehead Neck to show him the Marblehead Lighthouse. Our friend is quite a photographer, and he and I were both taking pictures of the lighthouse, even though the sun was setting and the park was already closed. This is the picture I took with my phonecam. When we got back to the house, we compared photographs; I imagine his photo will turn up on his blog ("Draw Breath"). Tonight I cropped my photo just a bit to get the composition I wanted. It's a nice souvenir of a lovely visit. After a busy week, I finally had a chance to get to Red Brick to work on this painting. By now, the flowers I am painting from in the still life set-up have dropped most of their blossoms and many of their leaves. But that doesn't matter because at this point I am working on the vase and the background. Today I spent about an hour working on the vase, trying to get the shape right, and more important, trying to make it symmetrical. (It's not quite there yet, but this is a work in progress.) For much of the hour I spent at the studio, I had the painting upside down on the easel to see the shapes differently. I also used a T-square and ruler to check the placement. 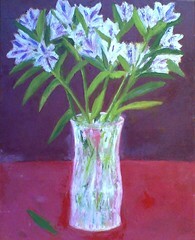 I used a brush to re-do the outline of the vase, and then I went over it with a palette knife. Checking for symmetry and making sure elipses are correct may not sound like a lot of fun, but those kinds of things make a big difference. But it was great to be painting today, even for just an hour. To be continued. . . Yesterday I went with my daughter to a Mother's Day Tea at Castle Hill, the big manor house in Ipswich. After the tea, there was a tour of the mansion. We have walked around the estate, including the beautiful set of rolling hills (the Grand Allee) that you see here, but we had never been inside the house. It was fantastic, from beginning to end! One of the first things I did was to take a photo of this view that you see immediately when you enter the building, a view of the back of the property through a set of windows in the entry way. 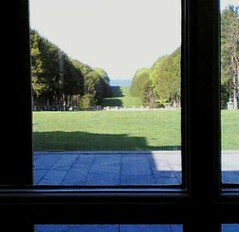 So you know immediately that you can see "the Grand Allee" from the house, all the way down to the sea. But this version of my photo has been digitally modified because in the original, two people were standing on the lawn outside the window. So tonight I opened the image in Painter IX and gently removed them from the scene with a little cut, a little paste, and some digital chalk. Then I cropped the image to get the composition I wanted, and also fiddled with the contrast a bit to compensate for the fact that the picture was taken through glass and a window screen. On Friday, my daughter gave me this beautiful bouquet for Mother's Day, and I have been enjoying it all weekend. 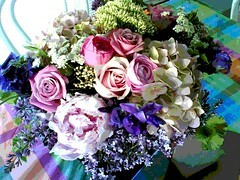 I love the combination of flowers: lilacs, roses, hydrangea, peonies, and more. When I got it home, I liked the way it looked on my table, so I took pictures. 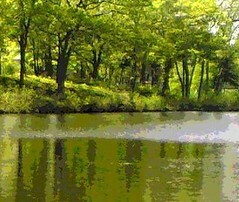 Tonight, I cropped one of the photos, then opened it in Painter IX and posterized it twice to get the effect I wanted. After I edited my photo of the birch tree and pond, I decided to make a posterized version of the image, and here it is. I opened the image in Painter IX and adjusted the controls until I had the effect I wanted. Here is a digitally edited version of the photo I posted yesterday. I opened the image in Painter IX to see what I could do about the distracting tree in the background that looked like it had serious problems leafing out. First, I used color overlay to put a transparent layer of green on top of the center of the tree. Then I used digital pastel to add detail, areas of light and shadow so the tree would blend in with the surrounding trees. I thought I was finished, but then remembered that I also needed to modify the reflection of the tree in the water, so I did, using digital pastel. Today the temperature shot up to 80 degrees, and everything is blossoming. 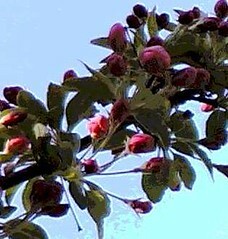 On a late afternoon walk, I looked up and saw this crabapple tree in bloom. 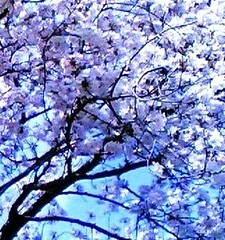 I liked the play of light and shadow on the blossoms so I took this picture with my phonecam. Tonight I cropped the image, trimming it just a bit to improve the composition. 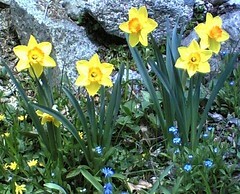 On a recent outing to Long Hill Gardens, I noticed this group of daffodils finally in bloom. I liked the way the flowers looked against the (very New England) stone wall, so I took a photo with my cameraphone. Later I cropped the image to focus on this little group of daffodils. Despite last night's cold air, we have warm temperatures today and the trees are leafing out. This image began as a photo that I took with my digital camera in mid-May of 2005. 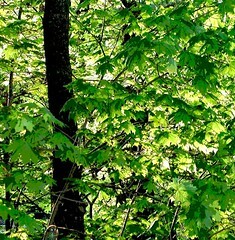 Tonight I cropped it and posterized it just a little to bring out the delicate yellow-green leaves. I decided to post this tonight because the beauty of the first leaves on trees is also fleeting. 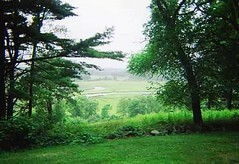 Robert Frost said: "Nature's first green is gold," and as he points out, it doesn't last long. (The name of the poem is "Nothing Gold Can Stay.") Some may see this as a pessimistic view (and I warn you that Frost's poem is certainly not wildly optimistic). But my view is that if something isn't going to last forever, then better hurry up, pay attention, and enjoy it. Flowering Tree at Long Hill Originally uploaded by randubnick. Some of the flowering trees are blooming! I used my phonecam to take this photo a few days ago during a walk at Long Hill Gardens. Blossoming trees always remind me of A.E. Housman's poem about cherry trees. (If you want to look it up, the first line is "Loveliest of trees, the cherry"; also I posted the entire poem on my blog April 30 2005.) Well, tonight, here in Boston there is a hard freeze warning, so who knows if the blossoms will still be on the trees tomorrow. Life is short, as Housman points out (even doing the math for us), so I take his advice and take time to appreciate cherry trees in bloom. Today I finally had a chance to return to Red Brick to work on this painting. I thought I would find that the flowers had wilted, but they are basically intact, despite a few fallen petals. Today I focused on the leaves and stems, using a both a palette knife and a brush. My goal was to define where each stem began and ended (including inside the vase), and also define the position of the leaves. It really helped to use a brush for the long straight lines and small spaces, but I may go back later and and add texture to the leaves with a palette knife. I am relieved to have the basics of the foliage painted in, because the flowers won't last forever. Next, I plan to work on the vase and the background. To be continued. . . Finally the flowering trees are either blooming or getting ready to bloom. My favorite is the crabapple tree because I love the color. Here in Beverly, the crabapple trees are not quite this far along, but I found a cell phone photo that I took last spring on the UNH campus in Durham, New Hampshire. (Sometimes it is warmer up north in inland New Hampshire than it is here in coastal Massachusetts!) Tonight I cropped the image and then posterized it, using Painter IX. This is another photo from this week's visit to Meadowbrook Farms. These marigolds were on a cart full of many kinds of flowers. 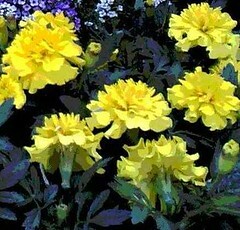 For this image, I cropped the photo to focus just on the yellow marigolds, and then decided to posterize the image in Painter IX. But after I posterized the image, I was unhappy with the composition. I struggled to get the composition I wanted, trying different ways of cropping the image. I guess I wanted to include every single marigold, and was being too hesitant about the cropping. But for the sake of the composition, I finally had to be decisive and make the cut. So I did, and here is the final version. This image is cropped from another phonecam photo that I took yesterday at the farmstand. I wanted a close-up shot of the little faces on these flowers. 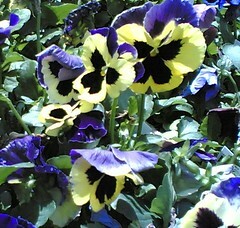 Looking at pansies always makes me smile, probably because they seem to be looking back at me. . . . I took this photo today at Meadowbrook Farms. I always get hungry seeing the beautiful fruit, vegetables, pies, and cookies in the local farmstands. But farmstands also offer a feast for the eyes! Today, carts filled with flowers were all around the outside of the store. Naturally, I took out my phonecam and started taking pictures. This is one of the photos, cropped for the composition I wanted. Once I had cropped the photo, I noticed a little mark on a leaf, in the perfect position to create a distraction. So I opened the image in Painter IX and used a little digital pastel to make the mark disappear. 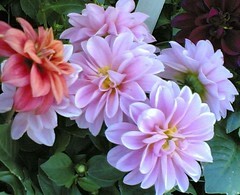 Now there is nothing to distract the eye from the soft light on the petals of the pale pink dahlias.